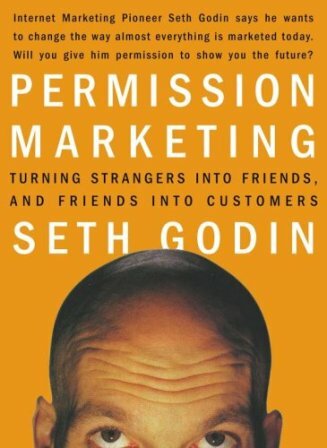 I recently finished Seth Godin's book "Permission Marketing". Written in the pre-social media days, the book was way ahead of its time. In short, it's all about obtaining increasing levels of permission from existing and prospective customers in order to more effectively build a relationship with them. For example, a low level permission may be a Facebook like or a Twitter follow, while a slightly higher level could be providing an email address or other contact information, with another level being the completion of a survey on an individual's interests or preferences. As you learn more about these consumers and earn higher levels of permission, you can then target them with sales pitches or ads that are more relevant, anticipated and personal. Taken to the extreme, companies like Google, Amazon and Apple have accounts that require a very high level of permission including payment information and other personal details. These accounts track the individual's shopping behavior and preferences, furthering the personalization process. These companies are then able to provide highly customized product recommendations and tailor the individual shopping experience for each customer. They have been able to leverage this high-level permission for unparalleled success. Godin stresses the importance of taking it slow and increasing your level of communication over time commensurate with the level of permission that has been granted by that individual. You do not want to overreach your level of permission and prompt the consumer to revoke your permission entirely. As you move up the permission ladder, your marketing efforts can become more personalized, more relevant and will be increasingly anticipated by that particular individual. You can facilitate the progression through these levels of permission by gaining the consumer's trust. You want to move from awareness to familiarity to trust to purchase, with trust being the catalyst from awareness and familiarity to purchase. Trust can be achieved in various ways. You can give your company a personality, via social media or other channels of communication, to become more than just another brand. You can also position your company as an expert through thought leadership pieces such as informative blog posts, white papers, podcasts, etc. You will also earn their trust in the way you manage the permission they have granted you. By building trust and taking the time to nurture your relationships with current and potential customers, they will be willing to grant you an increasing level of permission which will ultimately allow you to lock in that customer and make more sales. In the fast moving world of marketing, especially digital marketing, it is imperative that your email marketing strategy keeps pace with current trends. In this article I will attempt to enlighten you about some of the things you need to consider when embarking on an email strategy. Written in the pre-social media days, the book was way ahead of its time.